On 07-01-2018, at about 2039 hours, the three suspects pictured below befriended the victim at a business located in the 1600 block of White Lake Drive. The victim followed the three suspects into the parking lot area of the business. The suspects then got into a gray Honda passenger car. The suspects while sitting in the vehicle and the victim standing outside the vehicle asks the victim if he could change a ten dollar bill. The victim removed his wallet from his pocket and began to look through it. The suspects snatched the victim’s wallet and drove away. The suspects were last seen in a gray Honda sedan displaying North Carolina Registration Plate ID-099251, leaving the scene. The suspects may live in or around Robeson County. The Registration Plate displayed on the vehicle was previously reported stolen from an used car dealership in Lumberton. 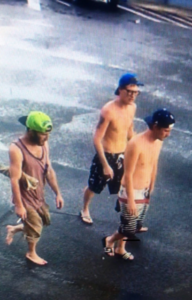 The White Lake Police Department needs the public’s assistance in identifying these three individuals.